After dropping some heavy hints at home, and frequently sharing a few links to Oliver Owls on eBay - my Christmas wishes came true! I’m now the proud owner of my very own Sarah Jane Smith soft toy as seen in her departing scenes at the end of Hand Of Fear - and I think at nine inches tall I’m pretty sure he’s the right size. 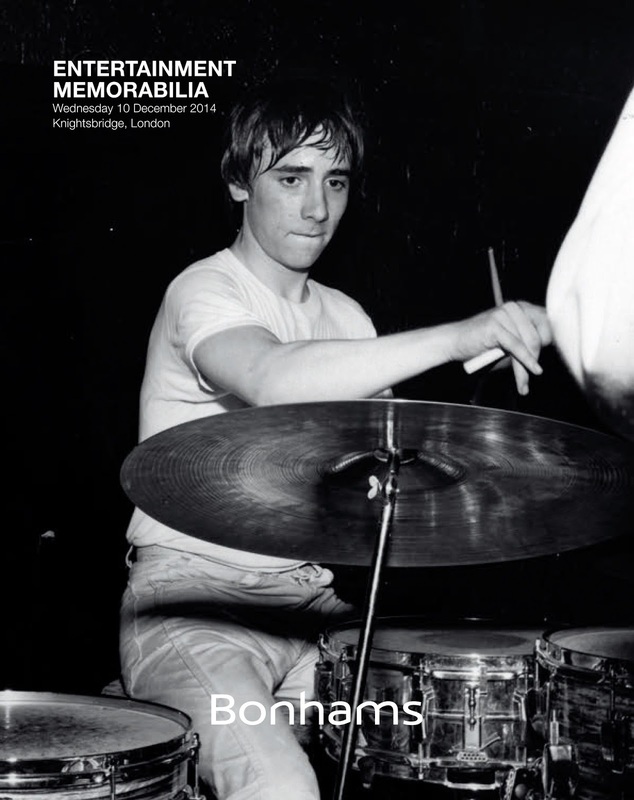 As you may have read, they came in at least three sizes with 12 and 16 inches completing the range (please correct me if I am wrong, as I’m basing this on what I have seen on eBay). One of my cats isn’t too sure about Oliver, but she’ll get used to it! I’ve seen a number of the larger sizes, but not the smaller, nine inch version. 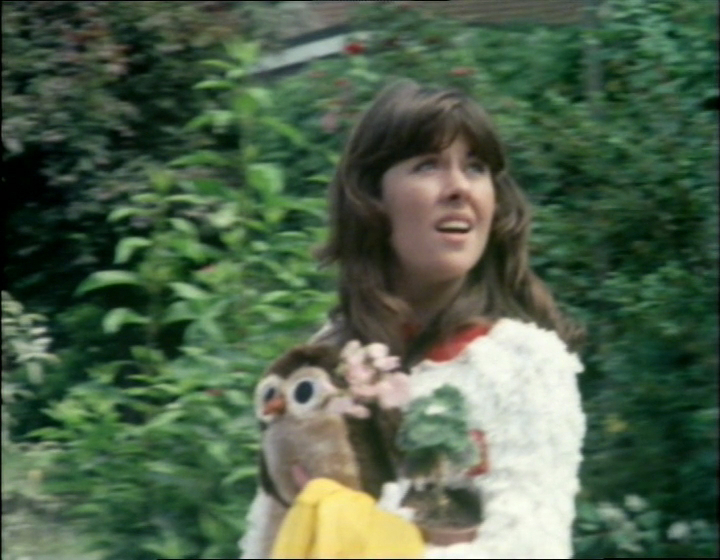 Looking at the closing scene of Hand Of Fear, and remembering that Elizabeth Sladen isn’t that tall, the owl appears to be quite small. 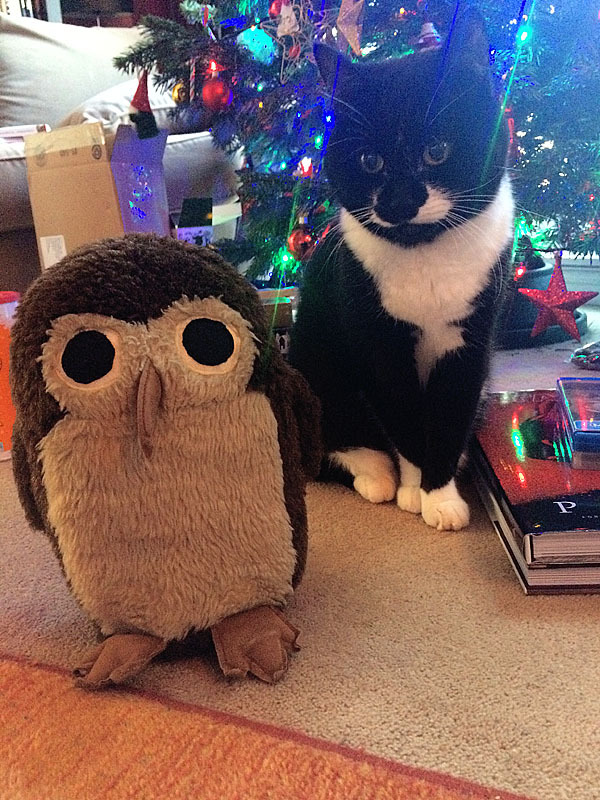 Happy Christmas - from Oliver Owl!!! 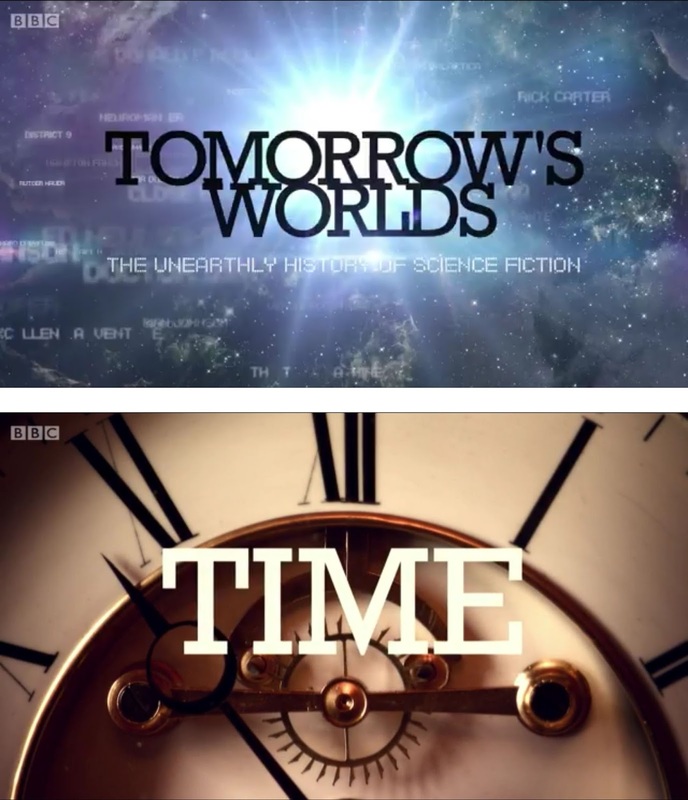 Last night saw the final episode of the BBC2 documentary series Tomorrow’s World: The Unearthly History of Science Fiction. 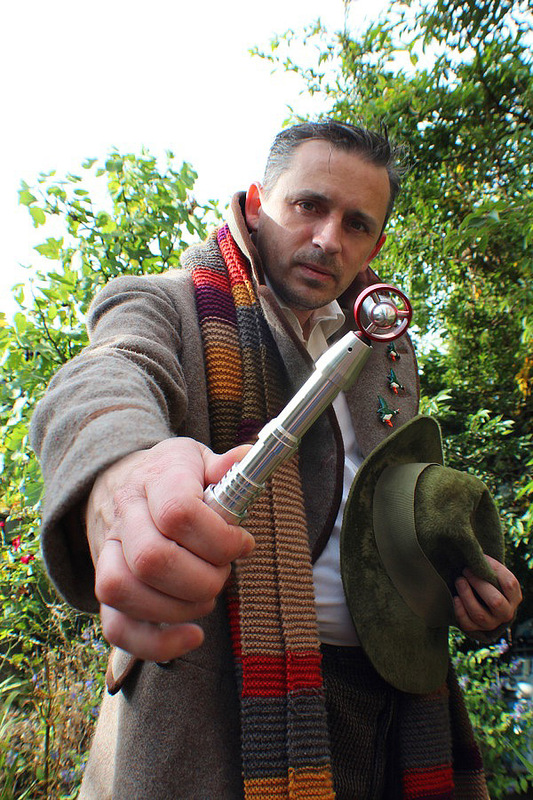 Presented by Dominic Sandbrook, episode four was all about time travel, and naturally encompassed Doctor Who. 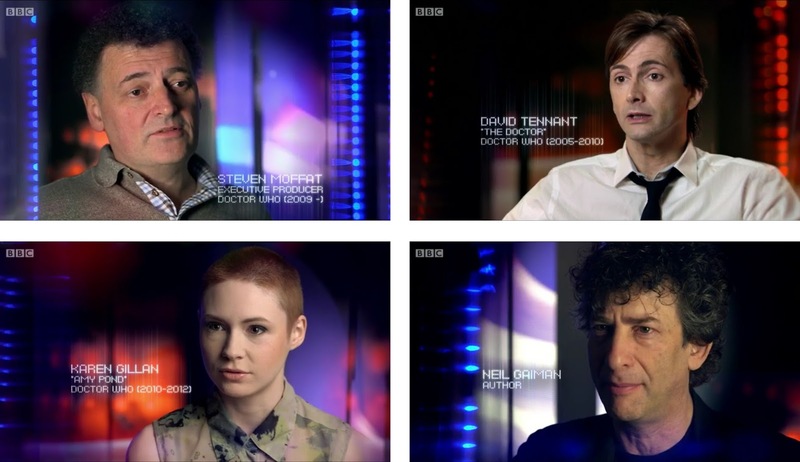 Interviewed were lead writer Steven Moffat, actors David Tennant and Karen Gillan as well as Neil Gaiman who talked in gerbil terms about sic-fi rather than specifically about Doctor Who. 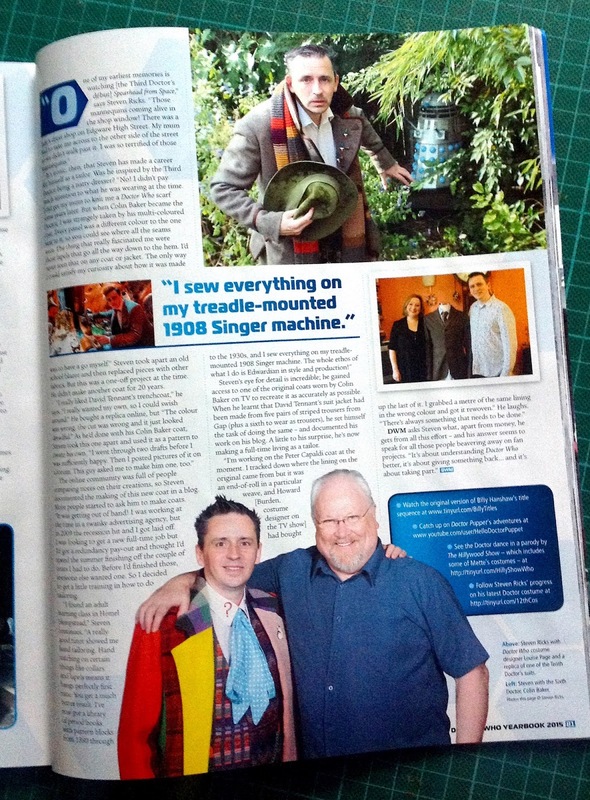 The Doctor Who section of the programme was linked with Dominic walking around the Experience in Cardiff. 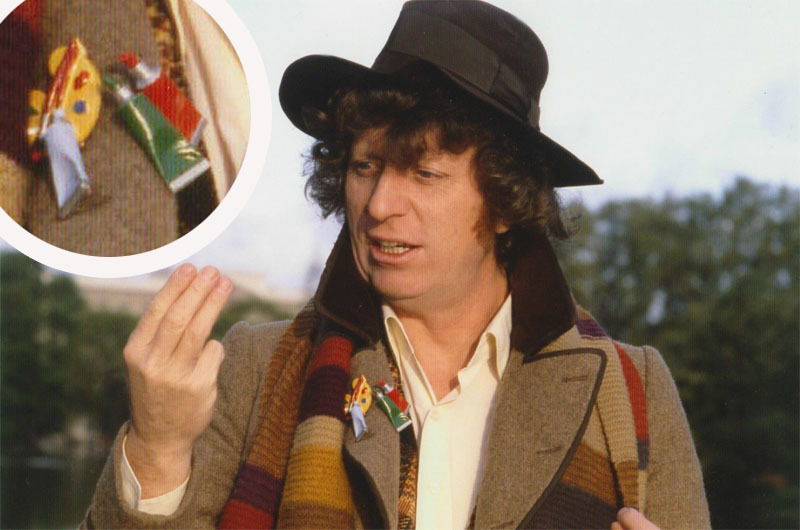 The thing that really caught my eye though was seeing the Tom Baker coat from the classic series Doctor costumes display. 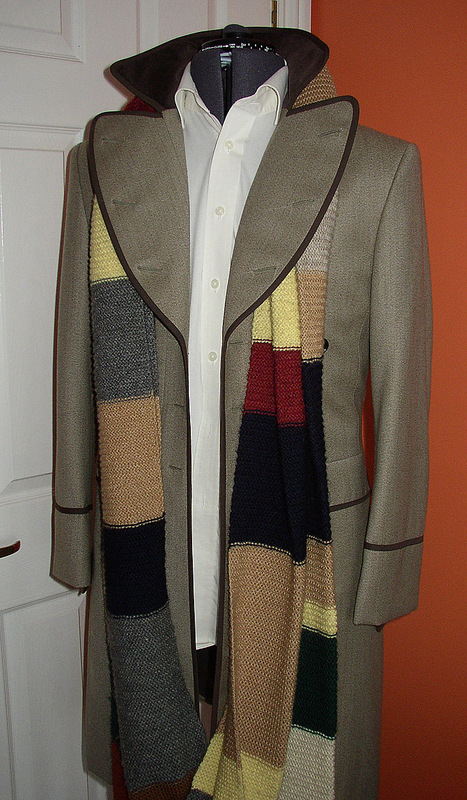 This is a coat I made for the exhibition, and it was on display during 2012 and 2013. 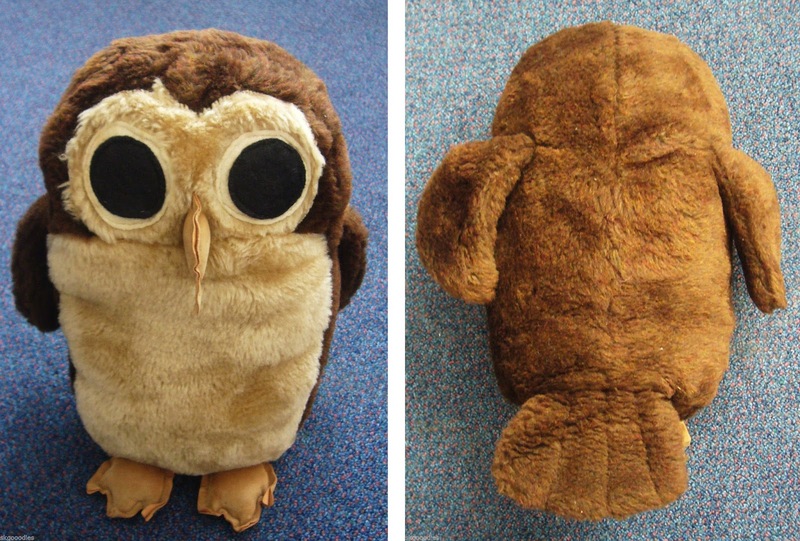 If you’re on the look out for your own Sarah Jane owl toy, you’d do well to have a look on eBay. These owls crop up from time to time and sell for around £50 to £100 a time, though you need to watch out for the size of the owl as several heights were made. 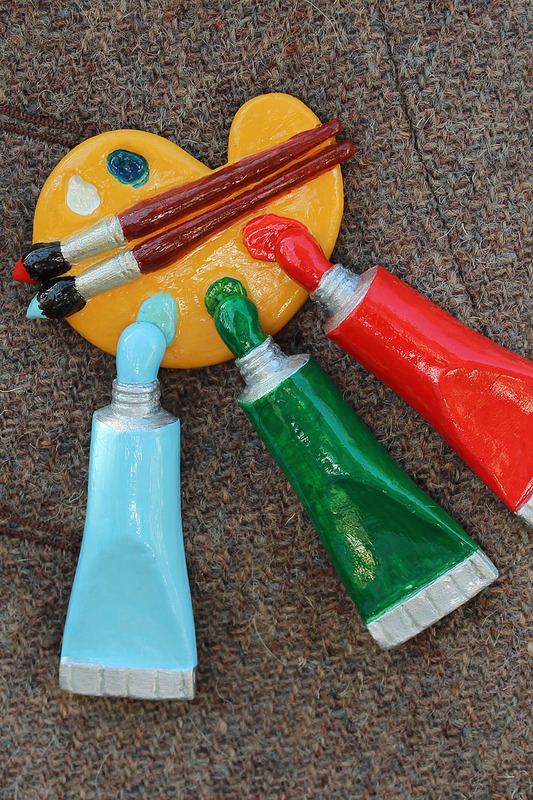 If you find their price tag a bit rich for your pocket, you could always have a go at making your own, and these listings come with some great detail pictures to work from. 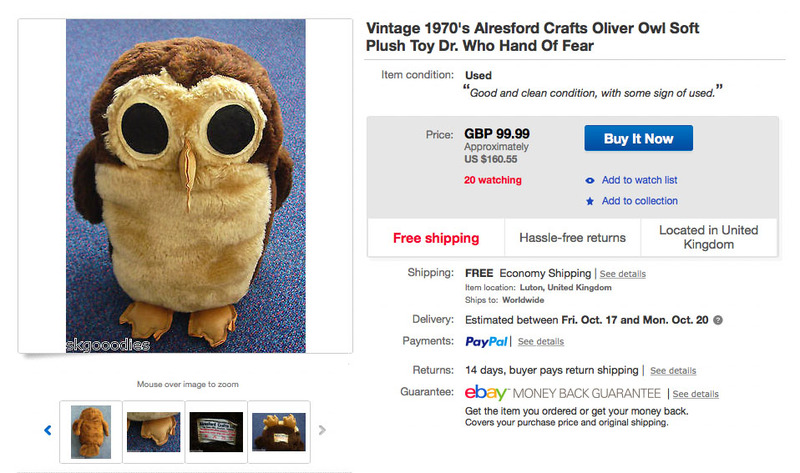 For sale vintage 1970's Oliver Owl plush toy made by Alresford Crafts Ltd. Measures approx 12". Rare and delightful in his own right he is the same as the one featured at the end of the 'Hand of Fear' Dr Who story when Sarah Jane leaves the Doctor. He also reappeared in 'The Sarah Jane Adventures', also this make of owl featured in 'ET'. Is in very good vintage condition. One of my clients sent me a couple of great photos today. He was on a trip to Paris and had to visit the Scarlioni Chateau - in full costume! 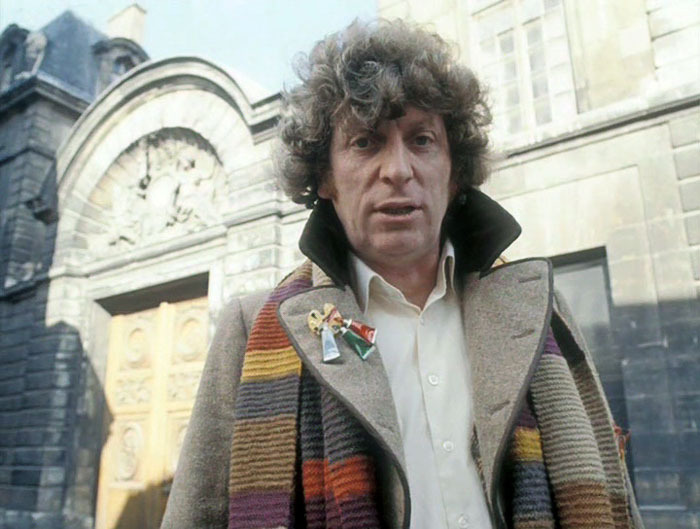 The street has hardly changed since filming took place in 1979, and he looks just the part in his screen accurate costume, finished off with one of my palette brooch sets. Paris, which is currently Oliviers et Co, a Mediterranean restaurant. 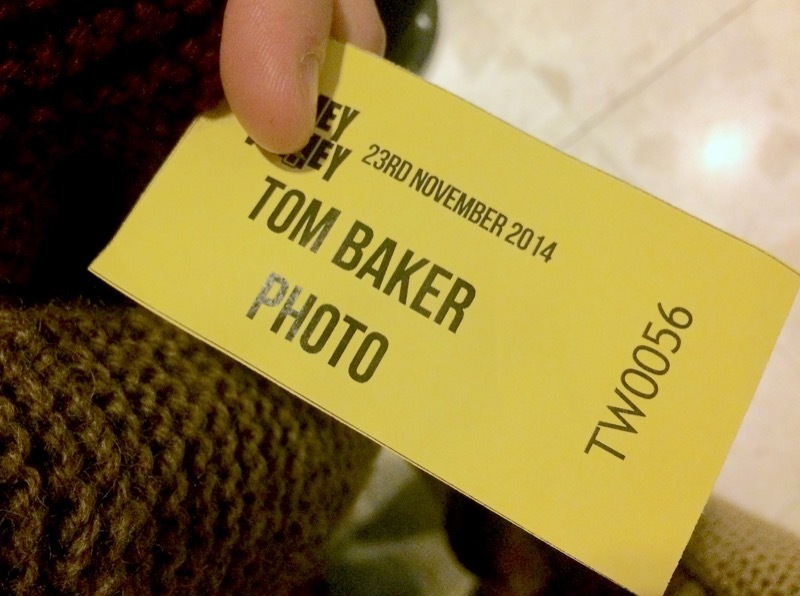 Today I took a trip down to Brighton for Timey Wimey - a small charity event headlined with none other than Tom Baker and Louise Jameson. It meant an early start, but luckily there is a direct train from where I live direct to Brighton central, so thankful it was a stress free trip. To pass the two hours productively I took along some hand stitching. 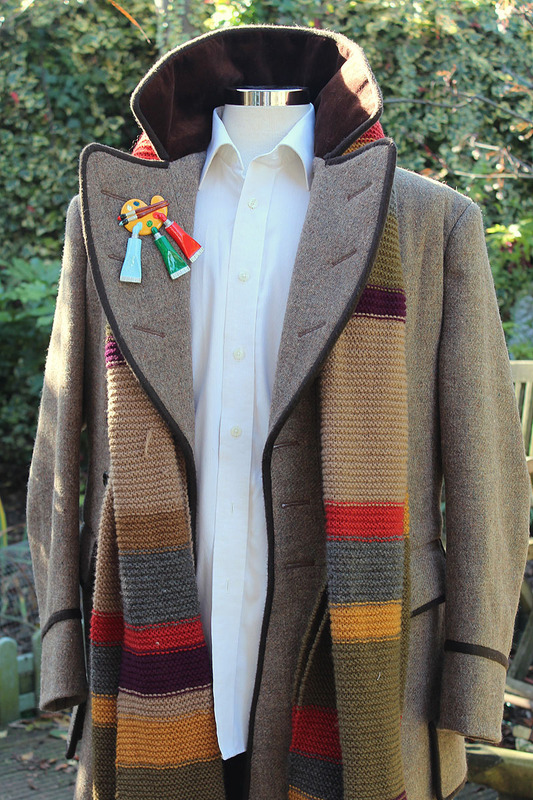 Someone soon will be getting a Sixth Doctor coat where their appliquéd strip was sewn while I was in full Tom Baker costume! The event took place at the Thistle Hotel on Brighton's sea front, only a stones throw from where the opening scenes of The Leisure Hive were shot. 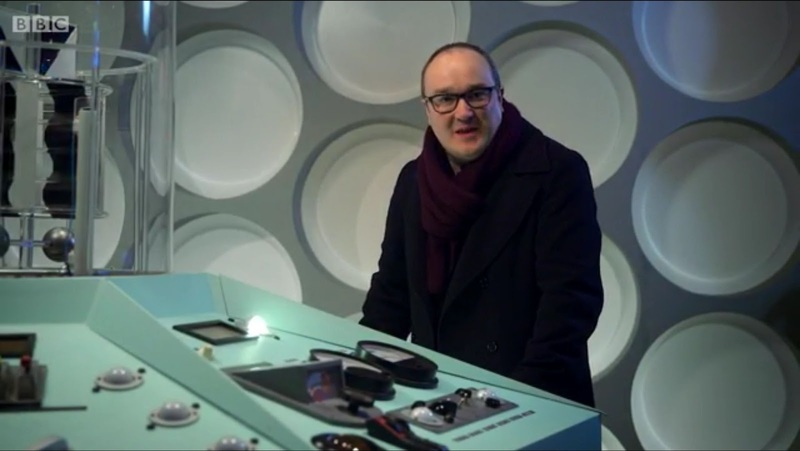 It was also close to Brighton Pier, where back in 2005 the very first new series Doctor Who exhibition took place. 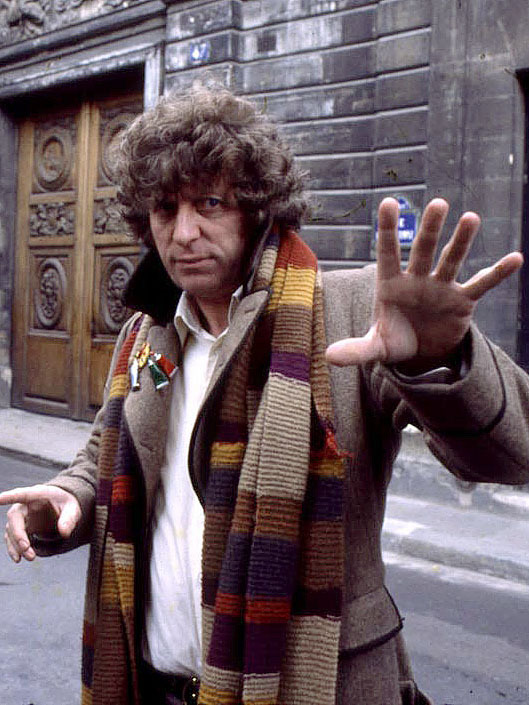 That was quite a small affair, with only 13 episodes to plunder for exhibits, compared to the all-singing all-dancing Doctor Who Experience in Cardiff. It was raining heavily when I got to Brighton, so a taxi to the hotel was in order - don’t want to ruin my costume! 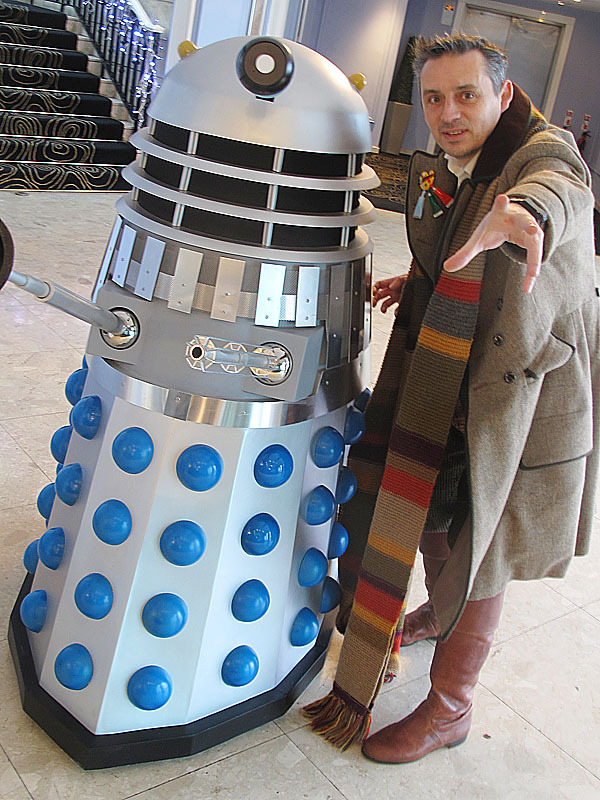 A Dalek was on hand to welcome everyone, and after registering I quickly realising I was one of only a scant handful in costume! A couple of the event crew were past clients of mine - so it was a shame they were obliged to wear their crew t-shirts rather than don the costumes I’d made them. 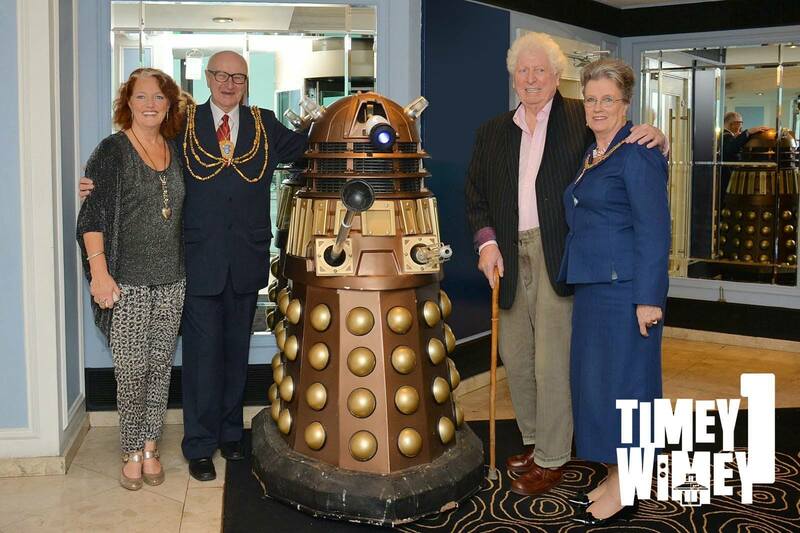 The event was officially opened by the mayor of Brighton, who affectionally recalled Tom’s visit for The Leisure Hive location filming. 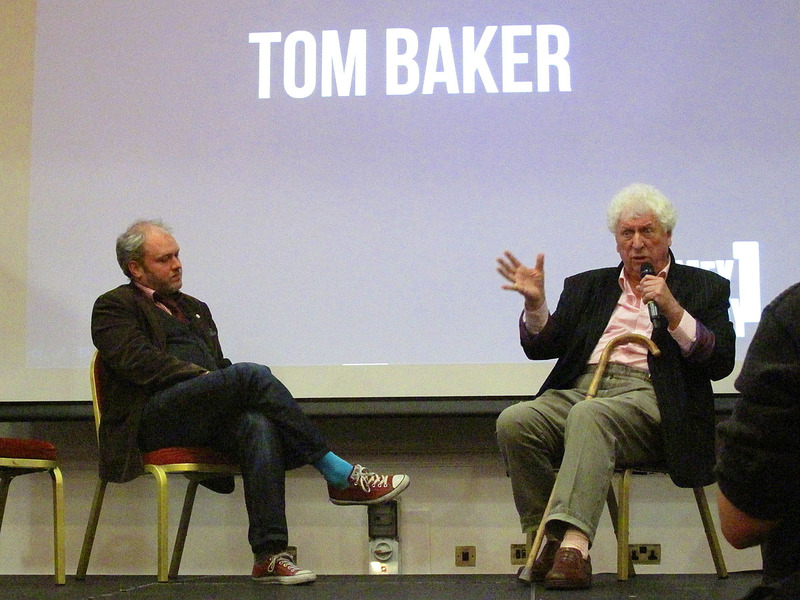 The first timetabled event at 10:30am was a stage talk between Toby Hadoke and Tom Baker. I say talk, but these days you just have to ask a vague question and it sets him off for an entertaining ramble of disconnected recollections, rants and general fantasy. Tom is like a senior citizen stand-up comedian, keeping his audience in the palm of his hand at all times with them hanging on his every word. He does it so effortlessly and it's a joy to watch. For all his off-track wanderings, he does surprise you by his total recall of episode titles when recalling specific guest artists who shared the screen with him. Once in a while Toby asked a question, or when Tom ran out of steam he turned to him for the next push down memory lane. To say the audience enjoyed his talk is an underestimation and by the standing ovation he received both before and after was testament to his enduring appeal and convention draw. 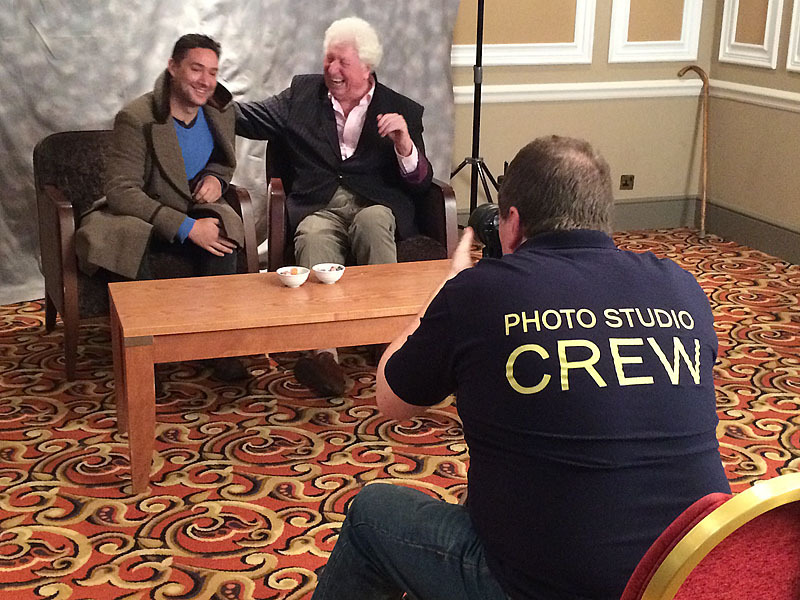 The next talk at 12:15pm was with Big Finish, but I was booked in for a one-to-one photo with Tom so I’ll have to catch them another time as I had to get in the queue. Since it was a small event with limited tickets available, the queue wasn’t too long and they got through everyone nice and quickly. 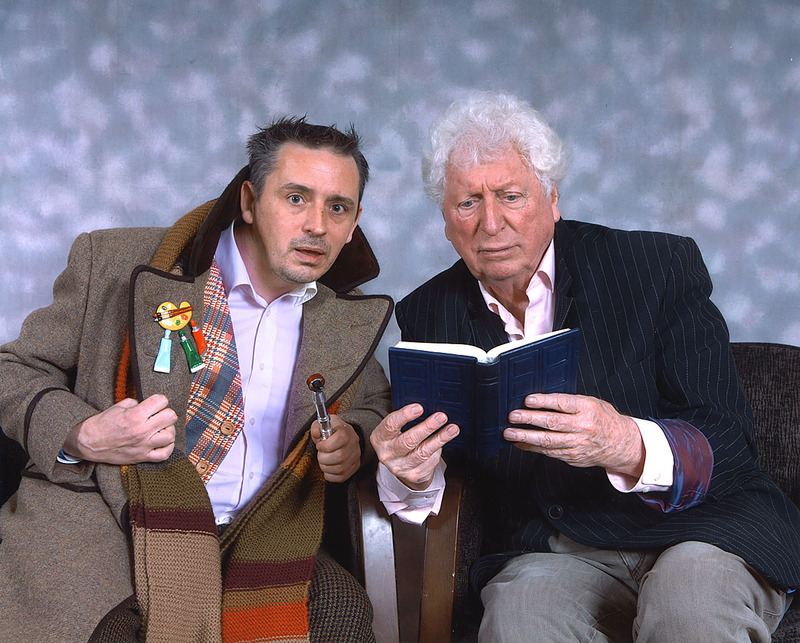 Tom was happy to play along and pretend to me reading my River Song diary. Not his best performance, but acceptable! 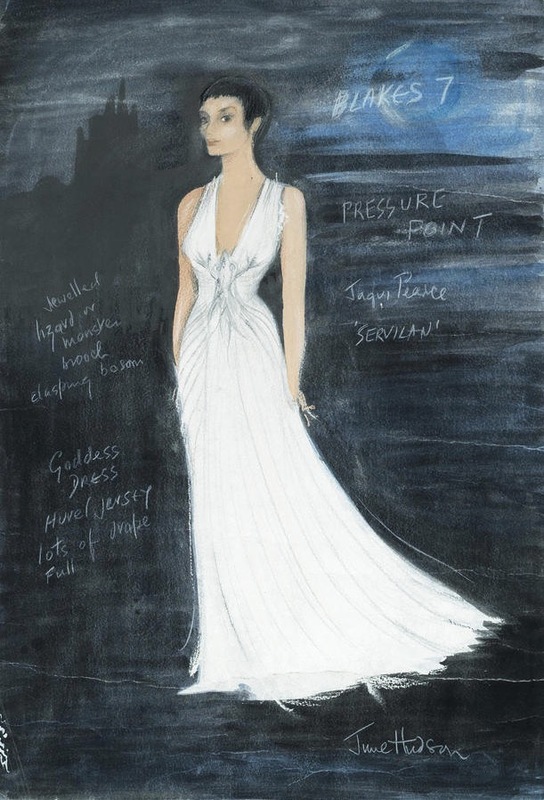 There’s not a great deal of Doctor Who items for sale, so I thought I’d share two lots which are costume designs by June Hudson for Blake’s 7. It’s always nice to look at some of June’s work! 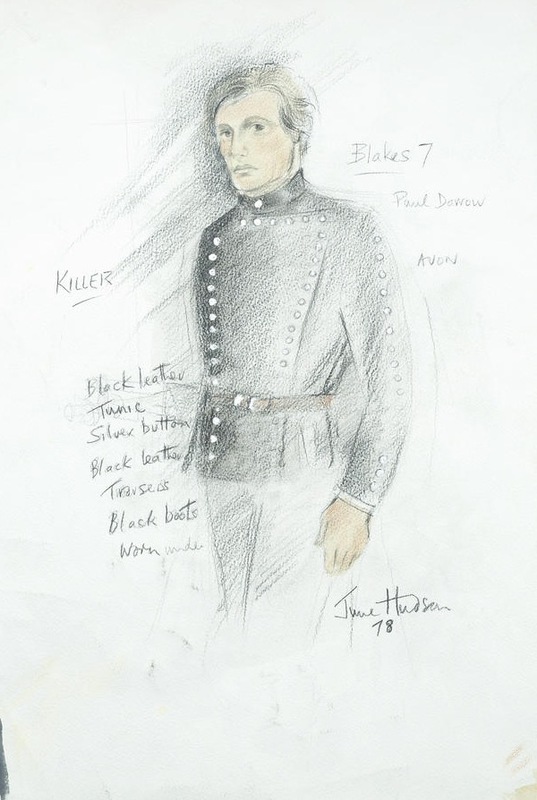 Blakes 7: An original costume design by June Hudson, 1978, depicting Paul Darrow as Avon, in 'Killer' (season 2, episode 7), pastel on cartridge paper, titled, signed and dated by the artist, with preparatory sketch for a different design to reverse, 15 x 22 inches (38 x 56cm). June Hudson, is a British costume designer, famed for her work on both Doctor Who and Blake's 7. Please see footnote to previous lot. 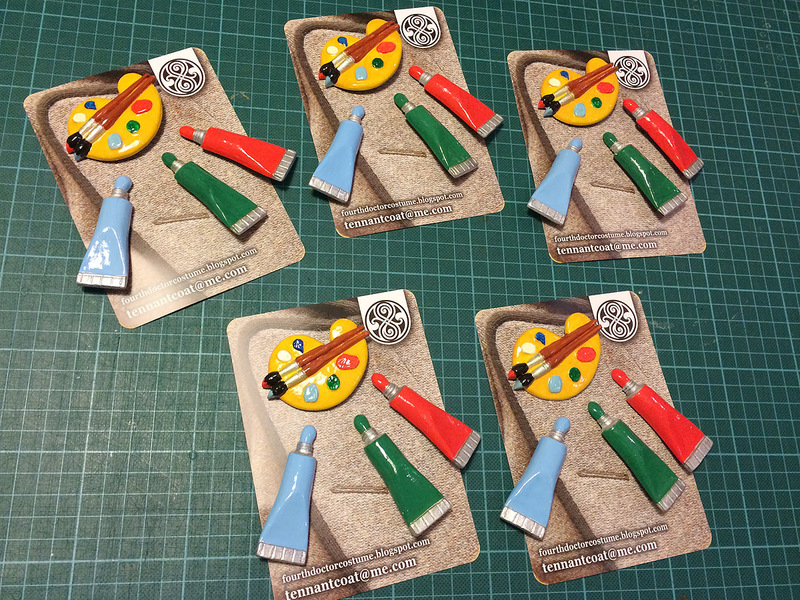 The first batch of palette brooches arrived today, so I’ve mounted them on their presentation cards and they’ll be going out int he post at the weekend. 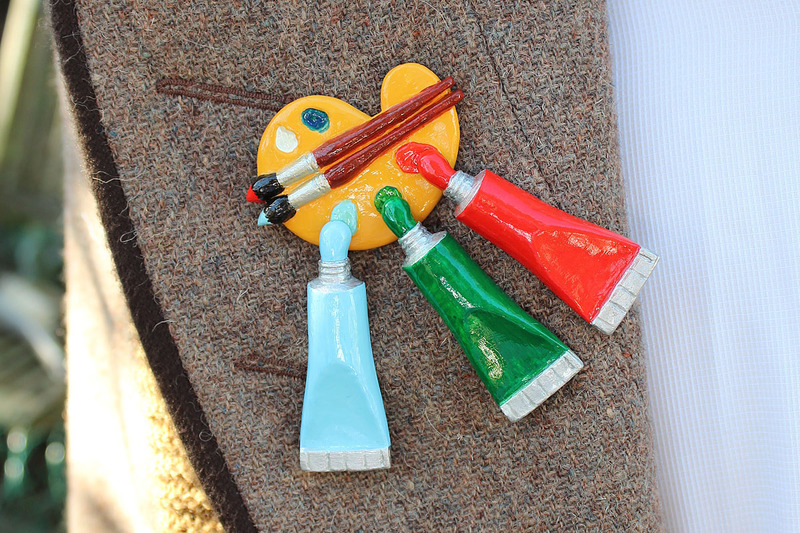 If you’ve ordered one you’ll see them soon - if you want to order a set - let me know as they are selling fast! I only posted news of my replica City Of Death brooch set earlier today, but I’ve had lots of emails already asking to buy them. 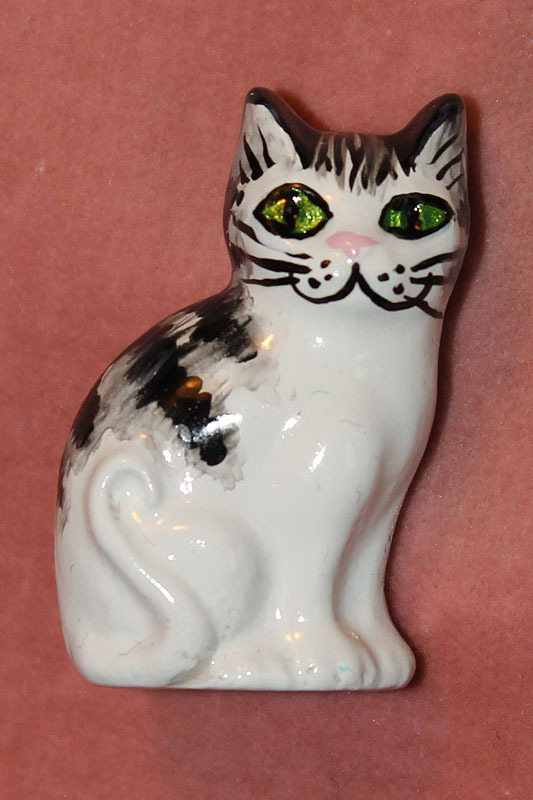 The sets are hand made by Susan Trevor, who made the ceramic cat brooch worn by Colin Baker, so have a genuine Doctor Who pedigree. One of the things that can finish of a good cosplay costume is a well chosen prop. 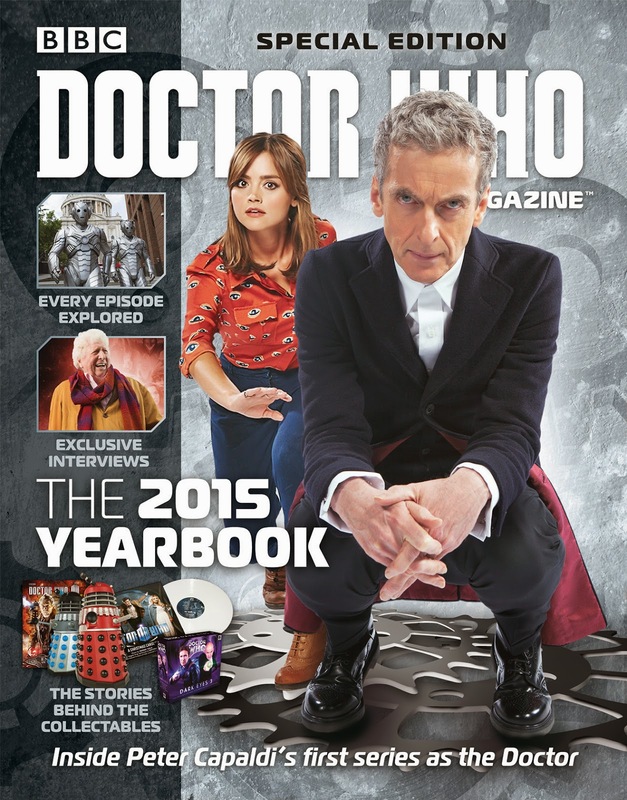 If you’re doing The Doctor, then a sonic screwdriver is a must. But if you’re doing a companion there are thing out there worth tracking down. When Sarah Jane finally left the TARDIS in The Hand Of Fear, she carries a handful of possessions, including a soft toy of an owl. 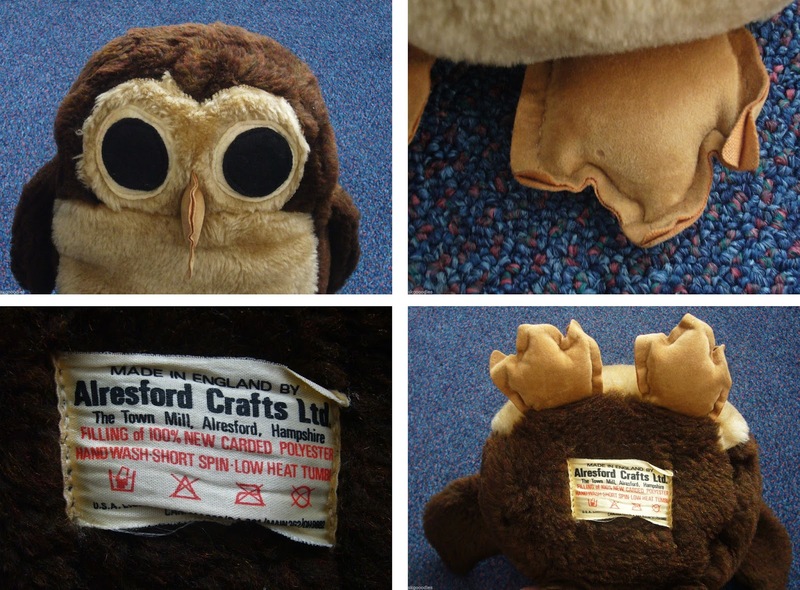 It ends up this owl is a toy called Oliver Owl, and was available in the mid 1970s from a company called Alresford Crafts. 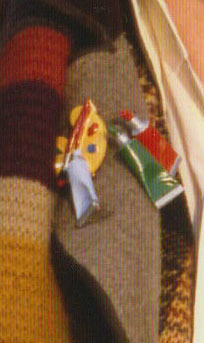 As well as appearing in Hand Of Fear, the makers of The Sarah Jane Adventures had a little fun by putting the toy in the background of Sarah’s attic - though you might notice it is a crude copy rather than an original. But this isn’t the only screen appearance of an Oliver Owl. It famously can be seen in the toy cupboard in the Steven Spielberg film, ET. 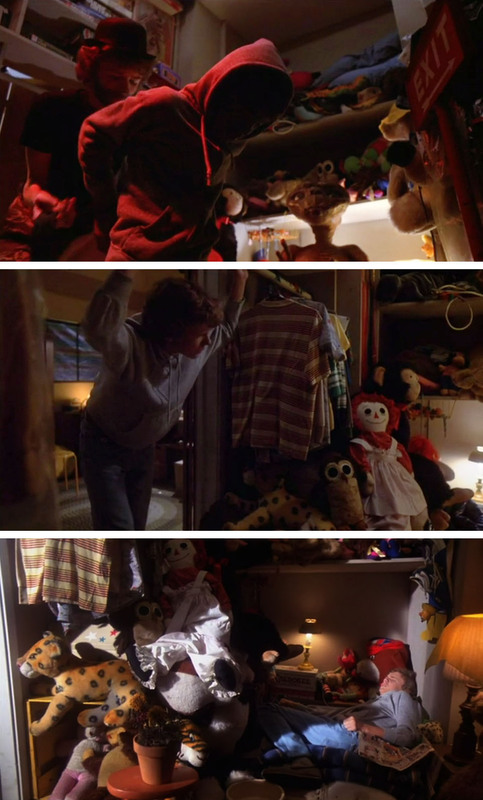 First it is seen on a shelf behind ET when Elliot dresses him for his Halloween Trick or Treat outing (01:01:03 into the film). Later, when Michael peeps over in the cupboard it can be seen on the floor to the left (01:25:12 into the film). Have you spotted an Oliver Owl in another film or tv episode?! 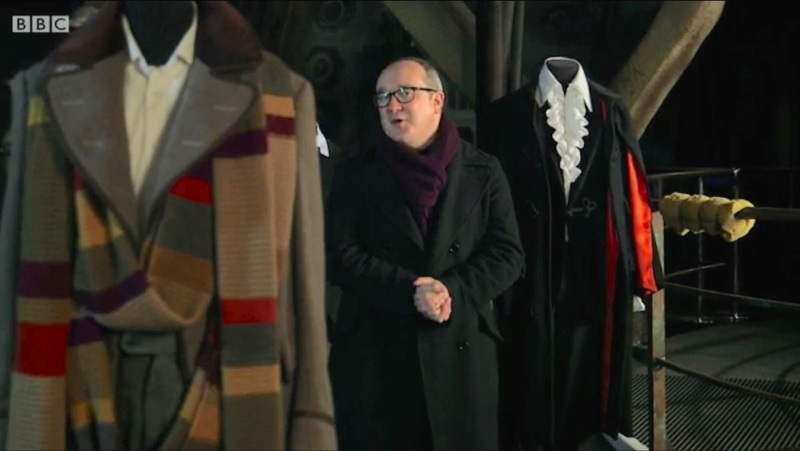 A little while back I had the chance to get my grubby mitts on one of the replica season 16 Frock Coats out there. It was interesting to see how another tailor had interpreted the coat, and knowing the original a bit more than most, how it fared. Forgive me for being brutal! There are a multitude of things that strike me about this coat, but the first I’d have to address is fabrics used. 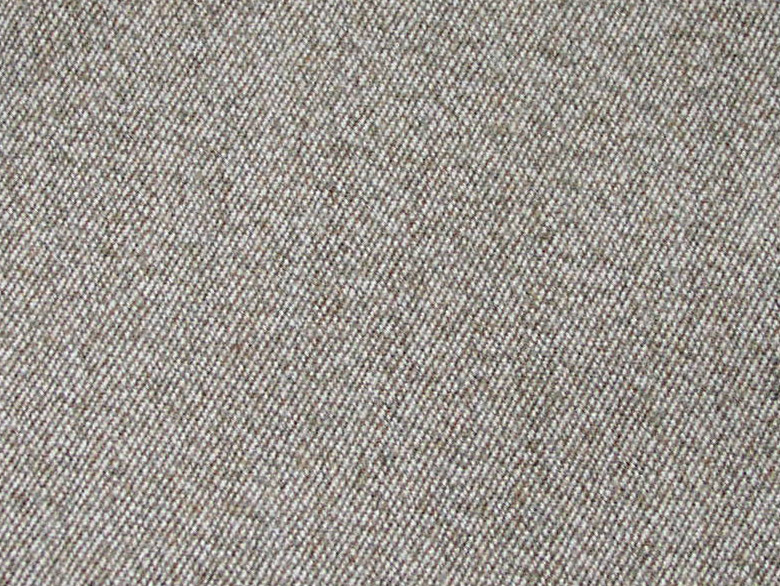 Rather than the plain and flecked coloured heavy, coarsely woven tweed, a relatively thin suiting cloth has been used which for me makes the feel of the coat just wrong. 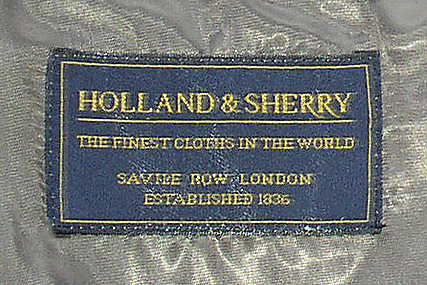 The fabric is a good quality, allegedly sourced from Holland & Sherry, a Savile Row tailors suppliers. That said, a quality fabric doesn’t make for a quality cut if the essence of the pattern is wrong. The rear of the coat is my main worry about the pattern used. 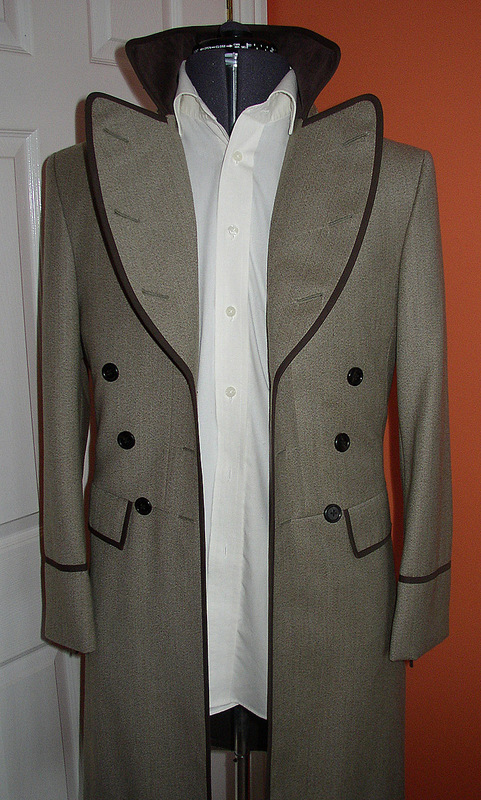 A frock coat should have a continuous drape of fabric all the way from the shoulders, down between the two back buttons and through to the hem. 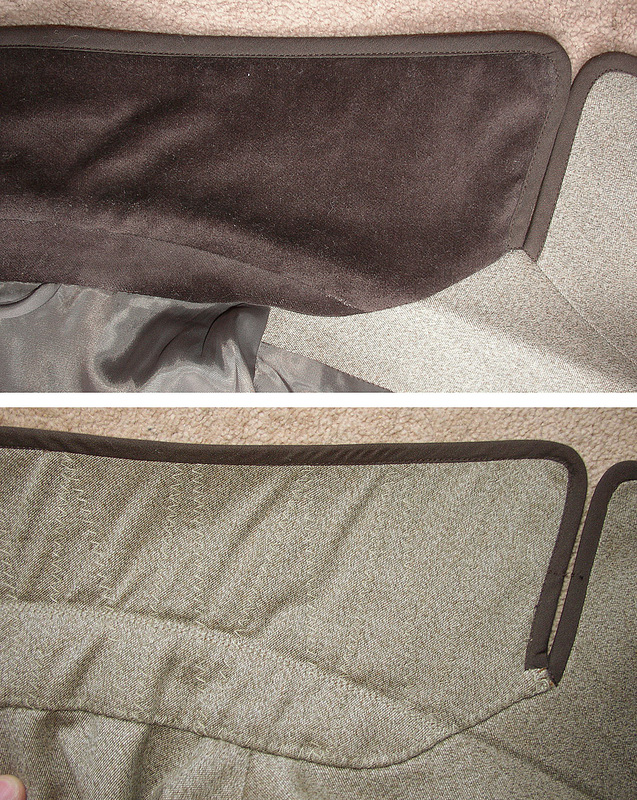 The skirt panels should then be between the front edges all the way around to meet these narrow tails. Here we essentially have a jacket with a skirt attached at a waistline seam running the full circumference of the coat. It has the tails as a frock coat, but they are too wide which pushes the buttons quite far apart. 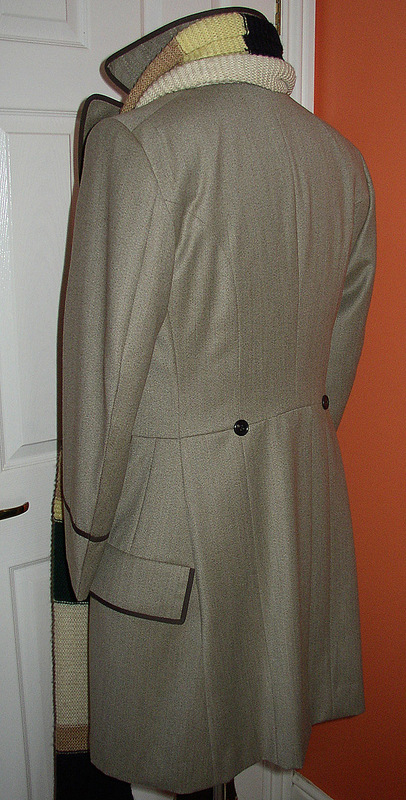 The skirt is in two sections, with an aggressive dart down to the rear pockets to create some girth, but this broadens the hips rather than spreads the skirt through to the hem, thus lacking the hourglass flare that is so typical of a real frock coat. 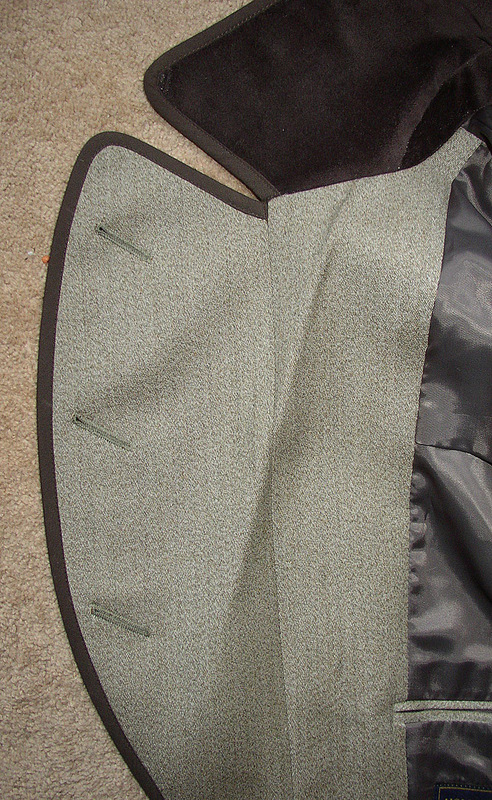 The pattern for the upper body of the coat has one panel each side too many. Essentially the vertical seam passing just behind the rear pocket simply shouldn’t be there. Turning to the collar and lapels, these aren’t too bad and are a good interpretation of the screen worn coat. The placement of the buttonholes and buttons is pretty accurate, though the buttons are disappointing as they are plain plastic rather than leather. 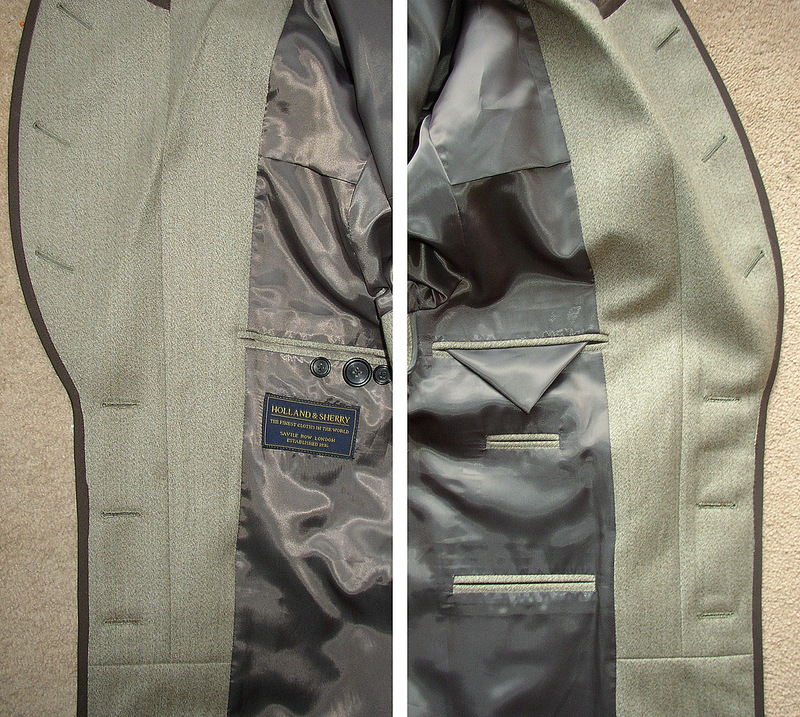 The split lapel has been well cut, giving the front of the coat a good appearance. With an appropriate scarf to hide the rest of the coat (here the one my mum knitted me in the 70s) it looks not so bad. The chocolate brown piping has been cheaply sourced and is nothing more than a cotton bias binding worth less than a quid a metre. It has been skilfully applied, but I don’t like they way the visible side has a line of stitching on show, whereas the underside is overlapped to hide the stitching. 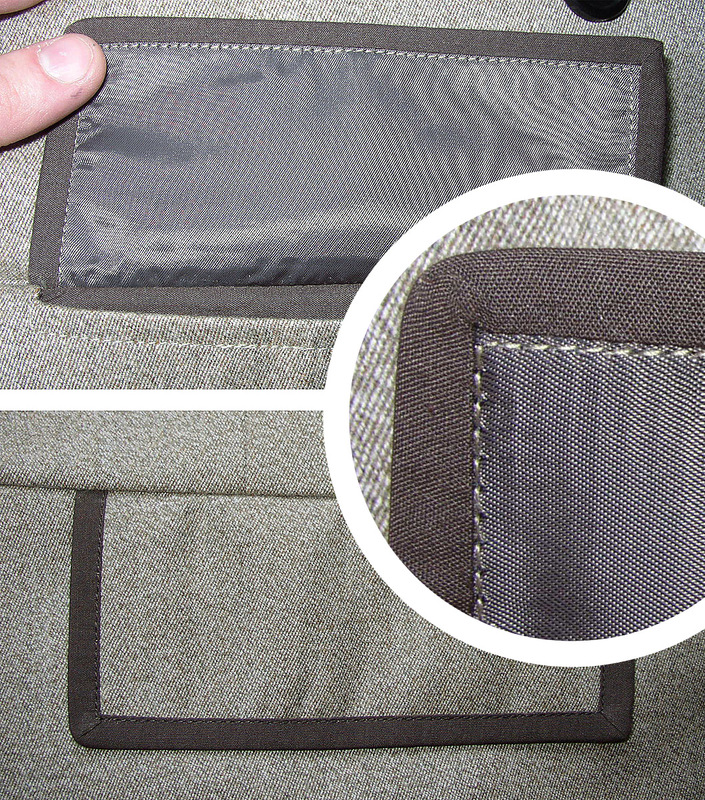 The pocket flaps are all simple rectangular shapes, lacking the characterful outward slope. It’s subtle but makes the difference for me. Internally the coat goes off on its own tangent, making things up as it goes along. The design of the internal pockets is very typical of the Far East tailors, with a multitude of sizes and positions on offer - one on the right side and three on the left. I’ve seen this in a number of suits originating from the orient. This over eggs the simplistic four patch pockets of the original coat. The coat is very competently made (aside from a burn to the velvet on the collar point - oops) but this doesn’t make up for the failure to appreciate what it should be made from or how it is cut and drapes. That said it could make for a good day-to-day wear that has been inspired by the costume, rather than quality screen accurate time of cosplay. City Of Death brooches - first batch in stock!